Heat gas or charcoal grill. Cut 2 (18x12-inch) sheets of heavy-duty foil. Spray with cooking spray. In medium bowl, mix melted butter, syrup, salt and red pepper. Add potatoes and bacon; stir until evenly coated. Divide mixture evenly among sheets of foil. Place packs on grill over medium heat. Cover grill; cook 12 minutes. Rotate packs 1/2 turn; cook 10 to 12 minutes longer or until potatoes are tender. Remove packs from grill, cut large X across top of each pack. Carefully fold back foil. Sprinkle potatoes with cheese; loosely close, and let stand 3 to 5 minutes or until cheese is melted. Garnish with green onions. To make in oven, place packs on cookie sheet. Bake at 375°F 40 to 45 minutes or until potatoes are tender. Add cheese and green onion garnish as directed above. If you like a little more spice, use 1/4 teaspoon of ground red pepper in this recipe. In the produce section, orange flesh sweet potatoes are often labeled as yams. 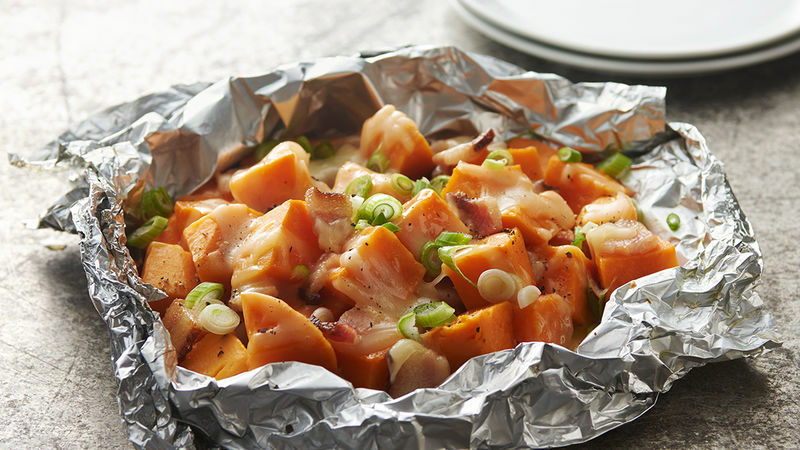 Any style of sweet potato will work in this recipe.